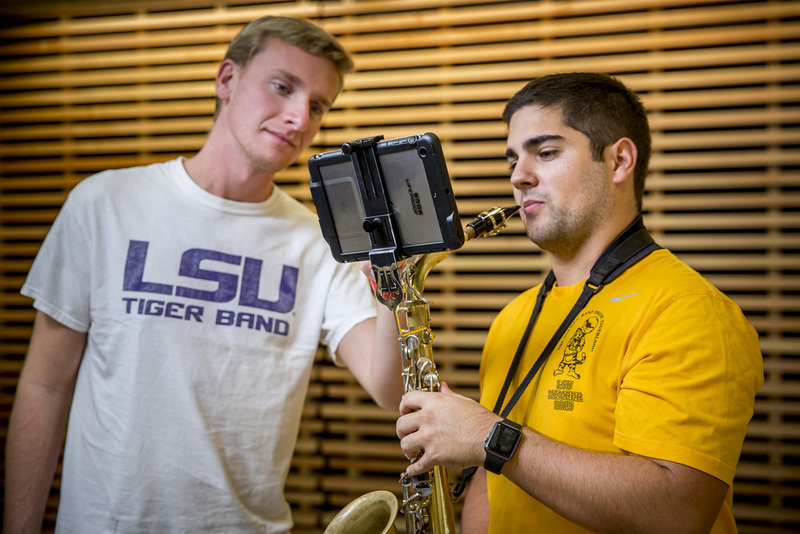 At LSU, "The Golden Band from Tiger Land" isn't just an activity, it's a way of life. For senior Drum Major, Daniel Wendt, and senior saxophonist, Garrett Kessling, that way of life could soon turn into a career path. In 2014 Wendt and Kessling founded Tonal Innovation, LLC. Their goal has been to bring the band industry into the 21st century. Earlier this year they entered into the LSU Elevator Pitch Competition that highlights student innovators across the campus. They didn't just win the competition they blew everyone out of the water. Then they went on to receive the ProtoStripes Client of the Year award at the LSU Louisiana Business and Technology Center. Their idea was simple, create a device that would allow musicians to use their phones and tablets in much the same manner as a flip folder. Over the past year and a half they have worked on developing eFlip. They pitched eFlip at various events including the LSU Elevator Pitch Night and at the SEC University Symposium event in Atlanta last year. "eFlip will give musicians on the marching field, in the classroom, and on stage the option to interact with music in a modern, hassle-free way, in addition to reducing the waste caused by printing mountains of music," said founder and CEO Garrett Kessling. So what is eFlip? It is a small, adjustable clamp that attaches to marching band instruments through a lyre and holds smart devices. 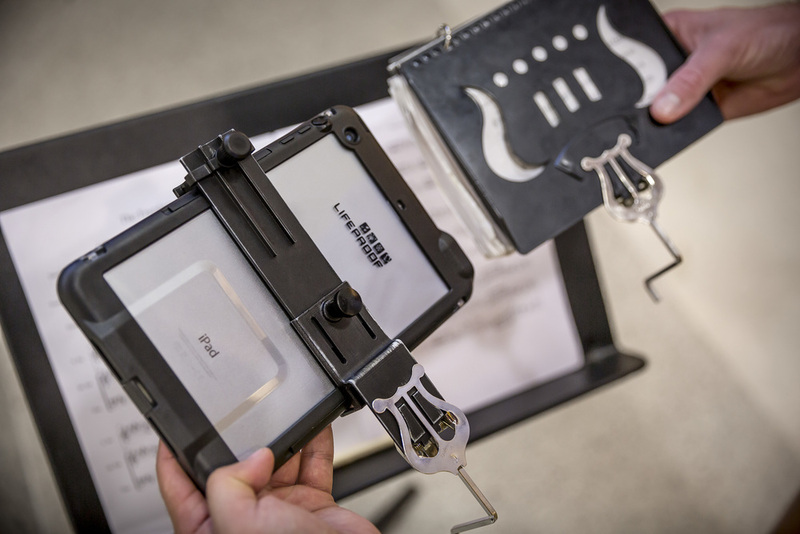 Reading music from smart devices instead of bulky paper books will make life on the field much easier for musicians because they don’t have to flip pages or deal with the glare created by the annoying plastic coverings on flip books. Plus as phones and tablets continue to be made water proof, there will be less replacing of music if a band gets caught in the rain. 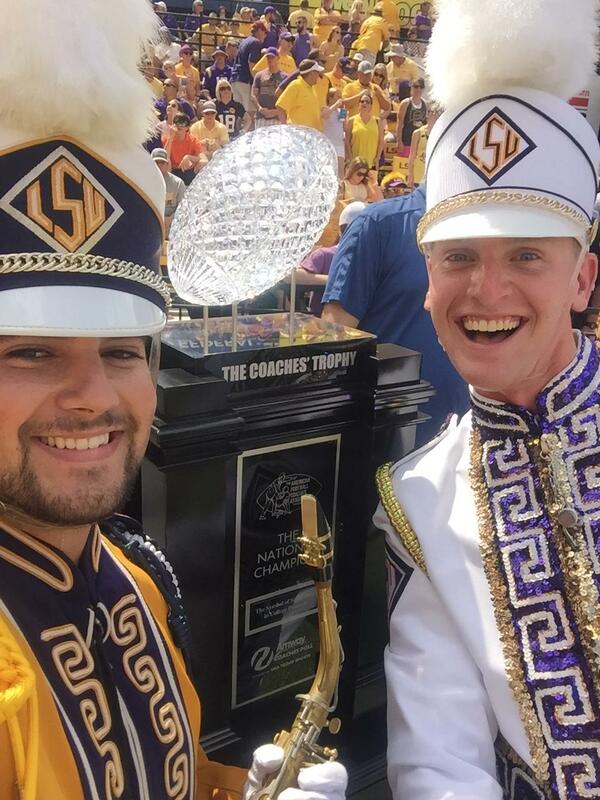 "I got the idea while sitting in a music rehearsal for Tiger Marching Band at LSU. We were trying to read a tiny piece of sheet music with a lot of runs and someone sarcastically suggested zooming, like the way you do on tablets and phones, and it just clicked," said Kessling. "So, I set out to create a way to do exactly that." By using eFlip, not only can the musician use their smart device to read digital sheet music or marching drill, but it enables musicians to use their device as a tuner or metronome, which enhances the performance of the individual and overall band sound. Their first prototype was developed using the LSU Student Incubator 3-D printer and since then they have worked with their advisers to start manufacturing the final design of eFlip this year. Their next big hurdle is finding funding and getting word out to the marching community, but both are excited about tackling this challenge and hope the band world will jump behind them with support. Want to help Tonal Innovation get off the ground? Support their kickstarter by clicking here!